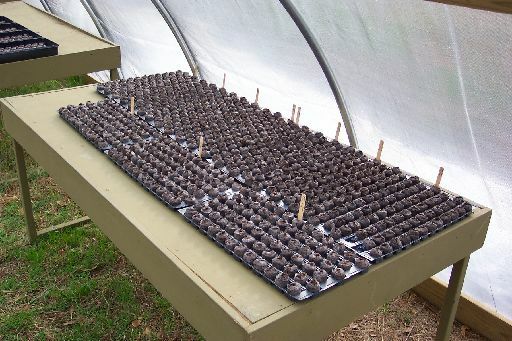 Got some quality greenhouse time over the weekend, and started several thousand seeds. In this photo, we see many trays of future orach, both ruby and golden, as well as kohlrabi and other goodies. The tables began their life as theater furniture for a set I designed for Biloxi Blues, and after the show, the theater generously let me haul them away rather than spend lots of time disassembling them for a few salvageable bits. The seed starting medium are small Jiffy peat pellets. They are 100% compressed peat from Canada surrounded by a vegetable starch net, and therefor suitable for my use. There is some confusion over peat, because the European peat fields are close to depletion. The Canadian fields, however, in a different climate and composed of a different moss, are regenerating faster than they are being mined and are in no danger. In the future, I'll be using "soil blocks", cubes of compressed soil and compost I'll make myself, but for now the Jiffy pellets will work well.